Temperature control units are frequently used in the plastics and rubber industries. 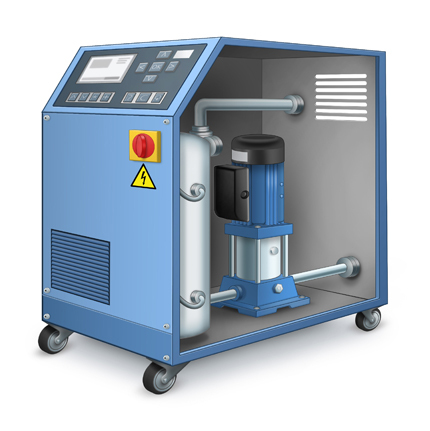 In these applications, they preheat the tools to operating temperature and dissipate the heat generated by the material during series production, thus avoiding overheating of the tool and damage to the product. Further application areas are in the chemical and pharmaceutical industries, in the food & beverage and packaging industries, metalworking or wood processing. A plastics machine frequently runs in continuous operation (24/7). The safe operation relies, in a large part, on the quality of the temperature control. Temperature control units have an external connection to a circuit, such as in the temperature control of an injection moulding tool in the plastics industry, and they are available as immersion baths, such as those used in laboratories or for quality assurance. The designs stretch from standard series production instruments through to project-designed temperature control plants (frequently multi-circuit systems) for production processes, for which large volumes of heat are required and possibly large quantities of heat must be removed. The versions cover cooling instruments down to -150 °C, to heating systems (thermal oil heaters) up to +400 °C. As a heat transfer medium, water, glycol or thermal oils are used. A level switch ensures that the heat transfer medium in the tank is sufficiently full and also controls the automatic refilling. If there is sufficient heat transfer fluid in the vessel, the circulation pump conveys it through the load and back to the vessel. In the tank, the actual temperature is measured and fed through to the temperature controller. If the actual temperature exceeds the set point, the solenoid valve from the cooling water connection opens and cools the heat transfer medium in the tank to the set temperature. In the opposite case, the heat transfer medium is heated, usually with an electric cartridge heater.